Just spotted this new tool from Microsoft. Looks pretty and nice--will let you know how it works for a basic level coder like myself. * Tree View synchronized with Node Text View for quick editing of node names and values. * Incremental search (Ctrl+I) in both tree and text views, so as you type it navigates to matching nodes. * Cut/copy/paste with full namespace support. 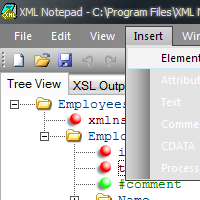 * Drag/drop support for easy manipulation of the tree, even across different instances of XML Notepad and from the file system. * Infinite undo/redo for all edit operations. * In place popup multi-line editing of large text node values. * Configurable fonts and colors via the options dialog. * Full find/replace dialog with support for regex and XPath. * Good performance on large XML documents, loading a 3mb document in about one second. * Instant XML schema validation while you edit with errors and warnings shown in the task list window. * Intellisense based on expected elements and attributes and enumerated simple type values. * Support for custom editors for date, dateTime and time datatypes and other types like color. * Handy nudge tool bar buttons for quick movement of nodes up and down the tree. * Inplace HTML viewer for processing xml-stylesheet processing instructions. * Built-in XML Diff tool. Spotted over at DownloadSquad (with pretty screenshots). Happy 15th Anniversary, Dearest Lavie. UVNC + SC + Hamachi = Bliss? Swiffer = Google of Cleaning? Browzar; Browsers and the End of Humanity?